What if one small adjustment to your workout could unlock the results you’ve been dreaming of? An easy and straightforward way to achieve healthy weight loss, this groundbreaking guide shows how just one hour of exercise a week can turn into a lifetime of wellbeing. We’re all aware of the ways today’s modern lifestyle takes a toll on our health—not enough time means fast food trumps nutritious meals and the couch wins over the treadmill. But did you know that just twenty minutes three days per week is all the time you need to burn away belly fat and get your health back on track? The trick: It has to be the right kind of exercise. Based on ten years of scientific research at the University of New South Wales, Belly Fat Breakthrough shows how, by incorporating a simple interval training routine and delicious Mediterranean eating plan, you can shed—and keep off—that stubborn excess belly fat. With simple, easy-to-follow guidelines, Dr. Stephen Boutcher explains how to apply exercise, healthy eating, and stress management in a practical, easy-to-follow program that will overhaul your bad habits. And you’ll see the difference in just six weeks. Too much belly fat increases your risk of developing type 2 diabetes and cardiovascular disease, and research has shown that most types of diet and exercise won’t help you lose it. At last there is a solution. Belly Fat Breakthrough will make you rethink your attitude to getting and staying healthy. It’s not simply a diet—it’s a total lifestyle revolution. Dr. Stephen Boutcher is an associate professor at the School of Medical Sciences at the University of New South Wales. With a special interest in healthy weight loss, he has spent ten years researching the best way to get maximum benefit from nutrition and exercise, and his book Belly Fat Breakthrough is the result. 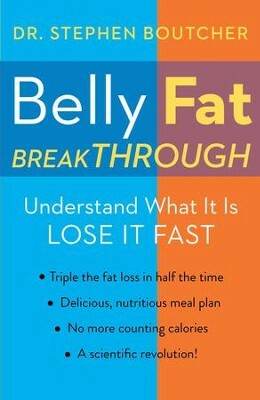 I'm the author/artist and I want to review Belly Fat Breakthrough: Understand What It Is and Lose It Fast - eBook.